Lisa Levart is an artist/activist and award-winning photographer who operates in the intersection between fine arts and social engagement. Inspired by mythology from all cultures and motivate to re-remember our collective Herstory, she has traveled the globe, creating photographs, videos, multi-media installations, books, and prints, all to convey the resonant and multifaceted manifestations of the feminine spirit. 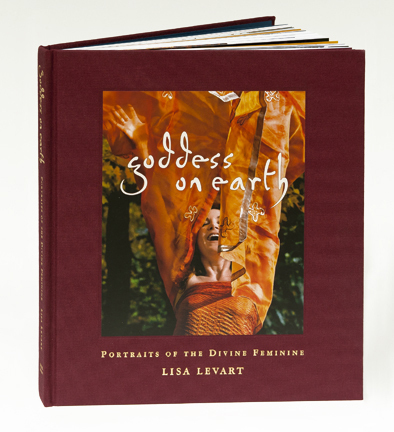 Goddess on Earth: Portraits of the Divine Feminine is an artist-made, limited edition book, printed by one of the most renowned bookmakers in the world. It has been sold at museum bookstores throughout America, including the Rubin Museum of Art in NYC. It has won a Gold Nautilus Book Award (past winners include Deepak Chopra, M.D., Marianne Williamson, and Christiane Northrup) and was named of the 100 Best New Women's Spirituality Books by the California Institute of Integral Studies. You can find Lisa at www.GoddessOnEarth.com. Please join Lisa for a meet-and-greet on Thursday, October 10, 2019, 7.00-9.00pm. Refreshments will be served and Lisa will sign her books, which will be available for sale directly from her. Of the 2000 editions printed, only 600 remain. Normally, this book retails for $75.00, but Lisa is offering it to SoulJourney customers, at this event only, for a special price of $65.00. Copyright 1997-2019 by SoulJourney. All rights reserved. All brand names and product names used on this website are trademarks or trade names of their respective holders. Revised February 26, 2019.